1870 Home port White Lake, MI. 1871 Owned Elton & McDonald, Trenton, MI. 1874 Owned Preston, St. Joseph, MI. 1876-79 Owned Thompson, Holland, MI. 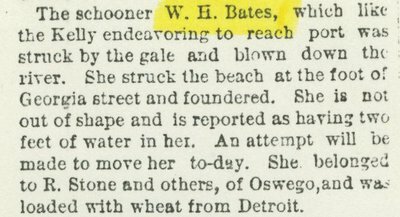 1880, Nov 7 Ashore Buffalo, NY; owned R. Stone, et al, Oswego, NY.